Takeaway: There is no substitute for face-to-face communication. If you want a safety culture, invest in regular face time focused on safety. As the supervisor for a large department in a factory that ran 24/7, I was used to long hours. I remember arriving to work early one morning only to find my boss walking into our offices off the factory floor. I was worried that something bad had happened. When I asked if everything was okay, he told me "Yes. I was just out visiting with workers about safety." My manager and mentor explained that he wanted employees to know safety is important to management. He made it clear to them that he never wanted to put safety at risk in some attempt to drive performance. Performance must be sustainable, which means zero accidents (see The Journey to Zero! to learn more). He also loved pointing out that we are social beings. It's human nature to talk about what’s important to us. When managers, supervisors, or anyone in a leadership role doesn't engage in face-to-face safety talks, workers pick up on a clear message: "Safety is not important." Before we can “walk the talk,” we have to actually have the talk. This is where safety begins. Employees should receive a consistent message about the importance of safety. At the Philips factory where I was the safety officer and senior trainer, we integrated safety into everything we did. The Gallup organization and other poll groups have questioned employees about how they receive information at work and what their preference is for communication. Face-to-face is always the number one answer. Employees know management only invests time on what’s important. If their immediate boss doesn't regularly set aside time to talk safety, it's hard not to get the impression that safety doesn't matter to them. A health and safety management system can be defined as the structure used to ensure safety. Communication of safety rules, initiatives, goals, and status is an important piece of the EHSM structure. Create a structured approach for your work safety communication that includes scheduled face time dedicated wholly to safety. The time invested will be returned many fold as communication uncovers opportunities. Scheduled safety talks – one-on-one or in groups – is a leading indicator of proactive safety. Capture how often safety is talked about formally and use it as a safety metric (find out what other 5 Metrics EHS Departments Should Be Tracking). I have witnessed in many locations that when safety talks go up, accidents and near misses go down. We need leading indicators we can focus on to drive all safety efforts. Frequency and positive reception of safety talks is a good leading indicator of a healthy safety work culture. Record your safety talks and their outcomes. Capture reception level (good or bad), topics discussed, safety dilemmas, concerns, and anything else that seems relevant to ensuring continued improvement in meeting safety targets (learn more about Leveraging Leading Indicators to Drive Safety). Employers that choose memos, email, and bulletin boards as their main forms of safety communication are choosing efficiency over effectiveness. We need two-way dialogue. We need to let questions be asked and have them answered. We want loyalty and trust connected to all work-related activities, including safety. Our strongest ability to influence others is face-to-face. Even our body chemistry verifies this. Flesh and bone communication releases oxytocin and serotonin. These hormones connect us and build our sense of trust and loyalty. How effective is your safety communication? Are you making the most of safety leading indicators or are you relying primarily on lagging indicators such as incidents and near misses (see Your Incentives Are Compromising Safety Culture to learn the dangers of focusing too much on lagging indicators)? 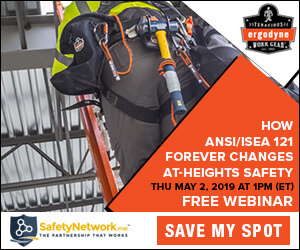 If you’re not scheduling safety face time with employees, here is a great opportunity for you to improve safety. Remember; before we can walk the talk, we have to start by having the talk – and to have it often. Make face-to-face safety talks one of your leading indicators for driving safety. Watch your incidents go down as your employee loyalty and trust go up.